Will Hoskin-Elliott remains a chance to face West Coast this Sunday, after the Collingwood forward was cleared of major damage to his leg. From one former Giant to another, Adam Treloar has offered advice to Will Hoskin-Elliott for his first game against former side Greater Western Sydney. 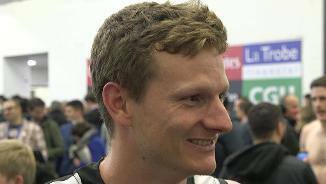 New Magpie Will Hoskin-Elliott says he's thriving under coach Nathan Buckley's directive to "back yourself", and has described the former champion as "a real caring bloke". From the moment he was chosen with pick No. 4 in the 2011 National Draft, Hoskin-Elliott was tipped for big things. But in four years at Greater Western Sydney, he was never able to pin down a regular senior spot. He appeared to be on his way to doing so in 2014 when he played 20 of 22 games, including a haul of five goals against the Western Bulldogs in the final game of the season. But just 11 games in 2015 and only two in 2016 saw him seek a fresh start back home in Victoria. On his day, Hoskin-Elliott has the ability to be a match winner, and his size and reach give him added versatility. Looms as a surprise packet in his first season at the Holden Centre. As his Giants teammates motored into a Preliminary Final, Hoskin-Elliott endured a year he would rather forget. He managed just two senior games, and none after round three, and instead was to ply his trade in the NEAFL. He played 10 games at state league level, averaging 20.8 disposals and kicking nine goals. Importantly, Hoskin-Elliott won 22 disposals, laid nine tackles and registered nine inside 50s in the Grand Final win over Sydney. 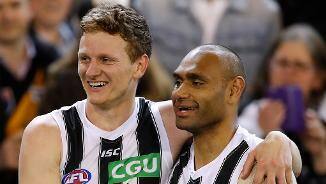 At year’s end, he requested a trade to Collingwood, the club he had supported as a child. It was a year to forget for Hoskin-Elliott, who failed to go on with the promise he showed the previous year when he kicked 26 goals in 20 games. Did not recover from a pre-season shoulder injury and finished with just three goals from 11 appearances. Has all the tools to be a star if he can find the consistency to match. The speedy youngster entered the year with 19 games under his belt over two seasons and a reputation for talent yet to be fully realised. He ended it with a further 20 games to his name and a standing as a star on the rise. Kicked 26 goals, second only at the Giants to Jeremy Cameron, he was one of their biggest improvers. Looks read to emerge as a star of the competition. Last season was another year of development for Hoskin-Elliott, who made nine senior appearances to take his career tally to 19. He had injury and form issues and suffered a nasty concussion late in the season, but the fleet-footed youngster is making good strides in his career. Considered among the most talented rookies on the GWS list, Hoskin-Elliott had difficulty adjusting to the rigours of the AFL, playing just three of the team’s first 16 matches. But he worked hard on his game and exploded into life in the final seven weeks of the season, capped by a five-goal, 16-disposal effort against Gold Coast in round 20. A dashing winger, the Giants are bullish about Hoskin-Elliott’s potential. More than happy to have a bounce and take on the opposition, he possesses a booming right boot and stood out at the Draft Combine. Played only 12 games with the Western Jets in 2011, yet finished second in the best and fairest count. 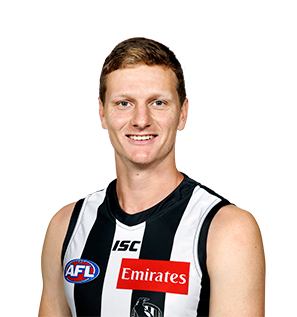 Traded by Greater Western Sydney to Collingwood in exchange for a (future) second round selection in the 2017 National Draft.